To Special Relationship, the AmericaxEngland livejournal community. Please check out the userinfo before posting, and enjoy your stay! (I'll only sell them separately if there are two buyers interested). Shipping & handling starting price will be $3 in the US. Please ask if you'll like extra protection (ie. bubble wrap). If you're interested, then please email me at ersatz_bluu@hotmail.com. Thanks for looking! 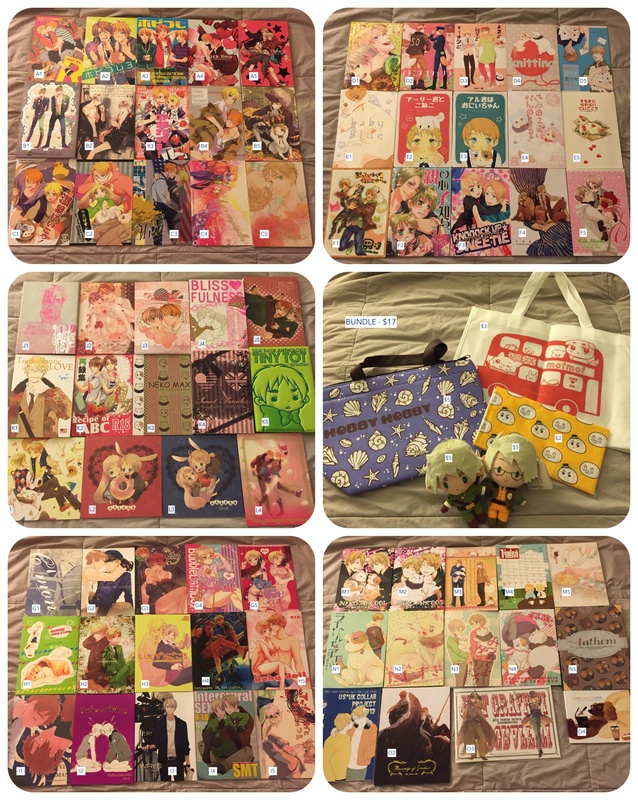 I have a bunch of different Hetalia merchandise both official and fanmade, as well as some other stuff from other series, and I have over 90 Hetalia doujinshi, about 30 of which are USUK/UKUS (plus another 70 or so doujinshi from miscellaneous series) so please check out my sales post on my LJ to see everything that I have for sale! Thank you! Hello! 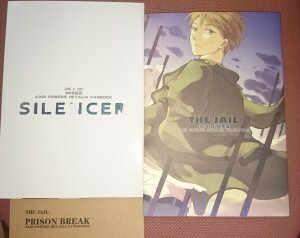 I have 2 Hetalia doujin sets (USxUK) for sale. Please take a look here if you are interested! Hi! :) It's been a while since I've posted on LJ... real life's been rough;; Long story short, I have to move out by November, and I need to seriously narrow down my collection for financial reasons as well as because of lack of space. I don't want to throw out everything, but unfortunately I have to get rid of whatever doesn't get sold... so I'm really hoping that there are some people here who will take this stuff off of my hands and give everything a new home. I have a bunch of different Hetalia merchandise both official and fanmade, as well as some other stuff from other series, and I have over 100 Hetalia doujinshi, about 40 of which are USUK/UKUS (plus another 70 or so doujinshi from miscellaneous series) so please check out my sales post on my LJ to see everything that I have for sale! Thank you! USUKUS Doujinshi for Sale! Low prices! GO TO MY SALES POST HERE! I'm selling some doujinshi's and other Hetalia stuff I bought during my time in Japan. What was that usxuk fan-made game? Back a few years ago, someone was making an RPG game about colonial America, which was usxuk-centric. It was a long project with demo updates spanning at least a year or so. I thought they were posting the updates to this page, but I haven't been able to find any of them in the archives. I thought I'd saved the demo videos on my YouTube favorites list, but I can't find them there either. Does anyone here know what I'm talking about? 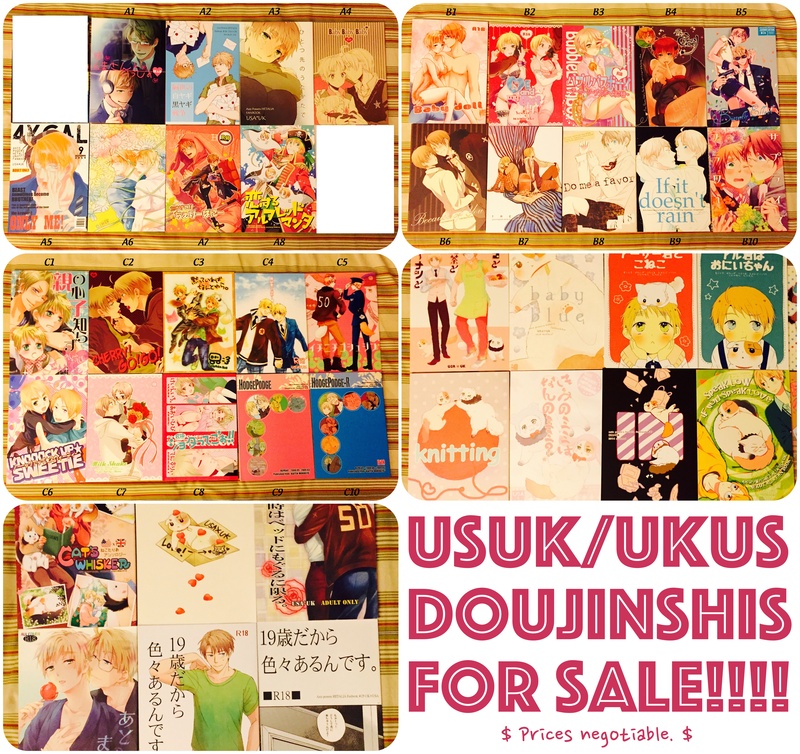 Selling tons of USUK and UK/US doujinshi as well as merchandise! I'm in serious need of room so I'm selling off some more USUK doujinshi! Come take a look if interested! The circles include: Cache-Cache, Bliss, Hobby Hobby, B*mpoc, rainy, monooji, koffy, Yes, Sir, etc. Hi! It's been like..five years since I was actively liking USUK (and Hetalia, in general), and now I got my groove back when a fic I followed years ago updated and I read it...then found myself looking through ffnet. I don't remember all the stories I've read for it, though (in the kink meme too, sob; lost my bookmarks). Can you all please give me lots of fic rec? Both old and new! (Im sure I missed out in lots of good fanfics!) I would bw veeeerryyy grateful! PRICE MARK DOWN! ALL DJS $15 OR LESS! As it is already February 14th in most of the world, it's time to kick off the Special Relationship Sweethearts Week! Please refer to the original post if you have any questions/don't know what the heck I'm talking about. Instructions on how to participate in today's theme on tumblr are here. Fic or art must be themed around Valentine’s Day in some way, shape, or form. You also need to include a note somewhere in the subject line or the post itself that it is a submission for the Special Relationship Sweethearts week. All fic/art for this particular theme must be posted by 11:59 GMT -11 on 2/14. Please tag any post you'd like to receive a Valentine for with the '2015 special relationship sweethearts' tag, in addition to the fic, art, doujinshi, vid, whatever it is you're submitting tag. We should be able to keep up on submissions, but on the off chance we miss one, having it readily tagged will help us go back and make sure that didn't happen. 2015 Special Relationship Sweethearts Week! Hello everyone! Here’s the official announcement and info post for the 2015 USUK SPECIAL RELATIONSHIP SWEETHEARTS WEEK. For the fifth year, but for the first time on tumblr, we’ll be celebrating Sweethearts Week, a week long celebration of USUK love, complete with prizes and the works. We hope that as many people as possible participate! It starts on Saturday February 14th and ends the next Friday, February 20th. The object of the project is for members to collect ‘Valentines.’ Valentines will be passed out by mods in reply to posts when we reblog them. Don’t worry, the Valentines will be small and unobtrusive. There are several ways in which to earn Valentines, and there’s no limit to the amount of Valentines you can collect. Members who collect the most Valentines will be awarded prizes. All other information including themes, rules, etc. is HERE! YOU CAN PARTICIPATE ON JUST LJ IF YOU DON'T WANT TO USE TUMBLR. Just post your fanworks over here on livejournal, and I'll make sure you get your Valentines. Good luck and have fun! Summary: It was raining quite heavily when Alfred F. Jones first met a man that, as cliche as it might sound, would change his life forever. Disclaimer: I own nothing but the story. I write fiction not reality. Hetalia and its characters belong to Hidekaz Himaruya.